Are you in a position where you need to confidently interact with IT people and better understand today’s corporate IT landscape? Well, here is your survival guide! 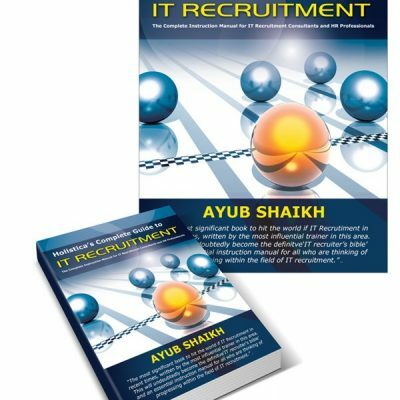 The Complete IT Recruitment Survival Guide will calmly steer you through the entire maze of key IT concepts in plain English. It will guide you through the jungle of terminology and acronyms with humour, stories and anecdotes, so that the ‘techies’ you speak with will assume you’ve been in the industry for years. The title is slightly misleading. Not just for those in IT recruitment, this is an invaluable easy-to-read handbook for all business executives and managers who simply wish to sound credible and comfortable when it comes to discussing all areas of IT strategy with members of the IT industry. Punctuated by cartoons by and bits of trivia, you’ll find yourself reading this in bed, and even relaying some of the stories over dinner parties. 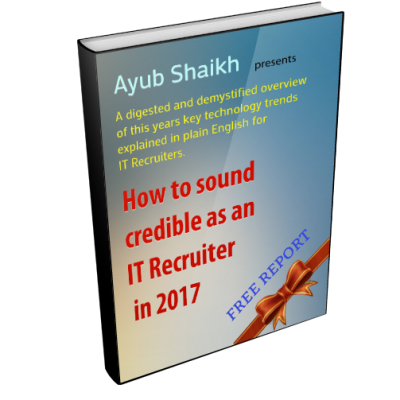 Ayub Shaikh is a renowned trainer, famous for having brought credibility, confidence and industry knowledge to thousands of business executives, IT recruitment consultants, HR professionals and resourcers through his training courses around the world. 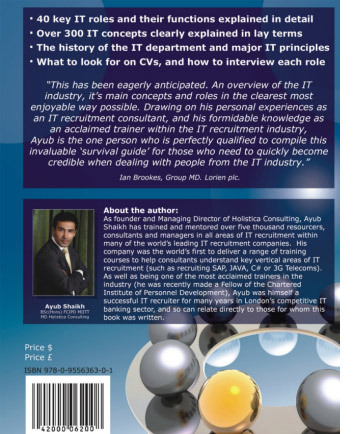 In the past Ayub himself was an accomplished IT recruiter in the financial heart of London and is now a mentor to some of the world’s largest IT recruitment consultancies. His company Holistica Consulting is the world’s only training company dedicated purely to teaching IT recruiters and resourcers all they need to know about the various IT vertical markets such as SAP, JAVA, C#, and Telecoms. Without doubt there is nobody more suited to writing the world’s first ‘survival guide’ for the IT Recruitment industry. * An overview of the IT industry and how it all came about. * All of the key IT concepts and jargon explained in lay terms. * An in-depth explanation of IT architecture, Software, Operating Systems and IT Methodologies - in simple non-technical terms. Each chapter is written with IT understanding and IT recruitment relevance in mind, and includes Interview questions and further techniques to help match candidates to jobs. This is a hugely significant work for the IT recruitment industry and those from the business wishing to understand IT. But do not be daunted (those of you who are squeamish about IT jargon and terminology). Those who have attended Ayub’s training will immediately relate to the uniquely simple, passionate and even humorous ways in which he puts across very complex IT concepts and principals. And his now famous easy-to-understand teaching style continues into this ground breaking book. IT knowledge is delivered in a reassuring and relaxed way; and the stories, trivia, and anecdotes flow throughout. This is an instruction manual like no other. With ‘The Complete IT Recruitment Survival Guide’ you have a constant, easy-to-understand yet knowledgeable companion as you tackle the murky waters of the world of IT recruitment. £29.99 (plus postage). USE THE LINKS BELOW TO PURCHASE NOW. Hopefully you will soon find out that this is a guide like no other. Not a reference manual but an enjoyable reading experience full of anecdotes, historical perspective, fascinating stories, and even (dare we say) humour. 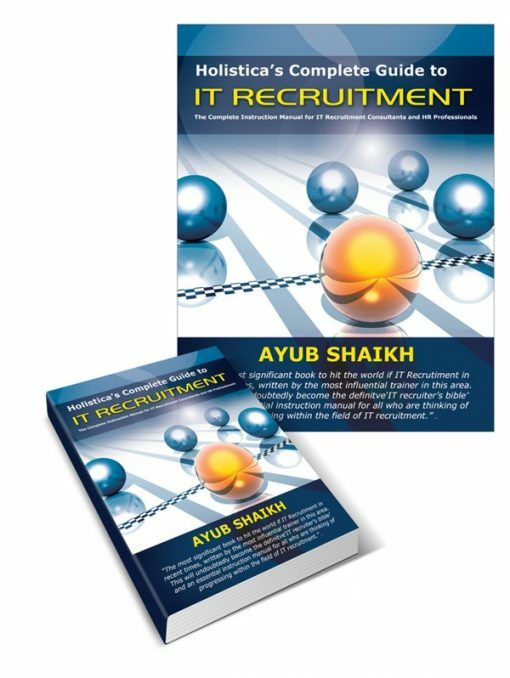 In this handbook the author shares with you all of the knowledge and insight he have picked up as a seasoned IT analyst and an IT recruitment trainer over the last eighteen years. Constantly aware that you won’t always have the time or luxury of reading each chapter as a full narrative, you’ll want to jump straight in to the key bits of information that count prior to a meeting or an interview. * An in-depth explanation of IT architecture, Software, Operating Systems and IT Methodologies – in simple non-technical terms.